Dozens of people, including two members of parliament and other senior government officials have lost their lives, and Somalia’s deputy prime minister was wounded. Scores of other civilians were also injured in a suicide attack at Central hotel in Mogadishu. Two explosions were heard during Friday prayers at a hotel near Somalia’s presidential palace and the national theater. “First the car bomb exploded at the gate of the hotel, and then a suicide bomber blew himself up in the hotel compound,” police Major Nur Mohamed told Reuters. 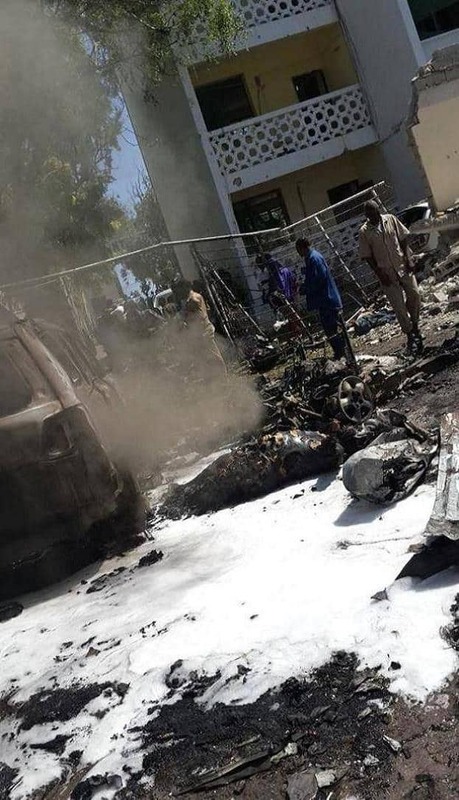 Deputy Mayor of Mogadishu, Mr. Mohamed Adan Guled, was killed in the explosion. He was a founder of Xog-Ogaal, Mogadishu’s first independent newspaper. Another victim, Mr. Abdishakur Mire Aden, was a regular commentator on VOA Somali programs and an author dealing with extremism. Al-Shabaab Islamists who previously vowed to target government officials have claimed responsibility for the attack. Update at time of publishing: 25 people were killed and 40 others were injured. “We will continue fighting against terrorism until we completely eliminate it. I am sure this attack proves the hypocrisy of the terrorist group who claim to be acting in the name of religion, while carrying out acts that are completely un-Islamic,” the president added. Despite Alshabab losing all its territorial strongholds, the group continues to control large rural areas and retains the ability to carry out gun attacks, using improvised explosive devices and vehicle bombings in several parts of the country.